Enter the Dragon: JKC marketing strategist David McGuire poses with the CGI Dragon character created for Japanese software giant Zuken. A Cornish marketing agency has spearheaded a global product launch for a Japanese software giant… with a little help from a fire-breathing dragon! The Falmouth-based John Knowles Company was approached by CAD software multinational Zuken to produce an innovative and eye-catching campaign for its new circuit board auto-router, ‘Dragon’. 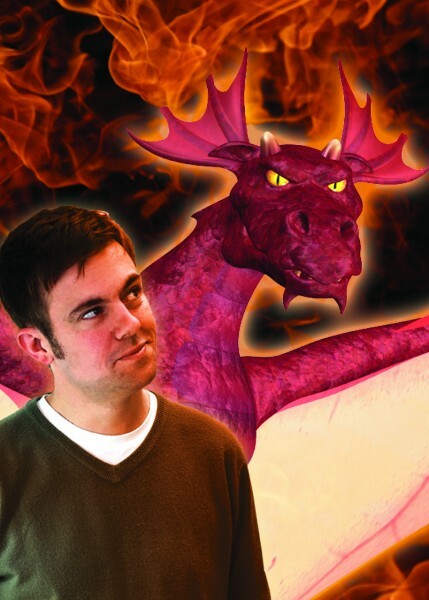 Together, the companies agreed an unusual strategy: creating a CGI Dragon character to personify the program. JKC’s project manager for the campaign, David McGuire, explains: “Marketing in the electronics software sector can be a little dry and technical to say the least. The Dragon router is a major step forward for that industry, so we knew we needed to do things a little differently, to really grab the audience and make it clear this is more than just another upgrade. Created with local assistance from Truro-based Lou Jones Design and Penwith animators Spider Eye, the Dragon stars in a minute-long promotional video and accompanying microsite. Moreover, because it was created not as a drawing but as a three-dimensional CGI figure, the character was simple to re-use in a variety of poses for other media, including downloadable wallpapers, screensavers and print advertisements. Although the campaign was initially commissioned by the Zuken’s Netherlands-based European Division, bosses at the company’s Japanese head office liked the Dragon so much, they immediately adopted the character and branding for the product’s launch worldwide – causing complications for the originators.